Craig Morgan Teicher, Cradle Book, BOA Editions, 2010. "Timeless yet timely and hopeful with a dark underbelly, these fables revive a tradition running from Aesop to W.S. Merwin. With a poet’s mastery, Craig Morgan Teicher creates strange worlds populated by animals fated for disaster and the people who interact with them, or simply act like them, including a very sad boy who wishes he had been raised by wolves. There are also a handful of badly behaving gods, a talking tree, and a shape-shifting room." "I've been reading Craig Morgan Teicher's Cradle Book, and so far it's really enjoyable. The author is married to the superb poet, Brenda Shaughnessy, so I learned just recently. I know Shaughnessy's work better than Morgan Teicher's in truth, but I was curious about this little book of fables that are part poems, part little stories and now am interested to go back and read his other book, Brenda is in the Room, now that I know who he is referring to in the title. I had no idea what to expect when I opened the book, and gradually discovered, I really like this little book. I have a problem with fiction--I simply have no patience to read it and have no patience to write it. If I do read it, I read it in one sitting at a rapid fire pace literally reading entire pages at one glance. But the Cradle Book is perfect for me. I can read these 1 to 2 page stories in a few minutes and then move onto another box of suprises. These actually read like little prose poems. The language isn't necessarily poetic, though. Neither is the rhythm of the language. I guess the frame of thinking, the philosophical mindset is clearly the mind of a poet, however. Occasionally, especially toward the end of these pieces, some of the poet in Morgan Teicher did come out, though as in "The Virtue of Birds" which ends: "The clamor closed in like a gloved hand slowly tightening its fingers." And the "The Line" which ends: "I will follow that line until there is no next thing." "In a culture glutted on narrative realism, Craig Morgan Teicher's Cradle Book reminds us of why we tell stories in the first place. If the title doesn't tip the hat, then the opening sentence confirms it: "This story is older than the words with which it was written." The gods of Teicher's universe aren't concerned with the careful piling up of details designed to push a character through a narrative arc. They hurl stories at the reader from the abyss of the unconscious. Characters are drawn in a flash of the pen, as in "The Groaning Cows": "She was the weaver's daughter, a quiet girl who kept rabbits and loved to make up songs." Plots move by a different causality than our objective reality: "Stop! She cried. "You must not kill these cows, or else terrible luck will befall us all!" The strength of these fictions, however, lies not in their difference from mainstream literature but in how Teicher manipulates his craft in ways unavailable to the realist: take the leap into the weaver girl's point of view in the last paragraph: "She knew then, when she heard the groaning, that her life would never be her own." That sudden shift forces the reader into a double epiphany regarding not only the forces that limit a life, but also the manner in which our good deeds become our punishment. "The Prisoner" creates tension by shifting perspective, but rather than going for the punch line, as lesser micro-fiction does, Teicher takes on big themes with biting wit: "First, I will make them abandon all dignity, pride and restraint as they torture me." In less than 250 words, Teicher hits on the truth of torture as well as Coetzee does in a 200-page novel: "Once they prove I am right, I will tell them the lie they want to hear: that there are some things we will not do." 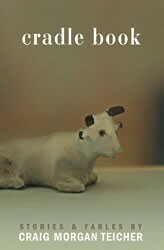 "Cradle Book is described as a series of fairytales. But Craig Morgan Teicher’s second collection of poems is more precisely described as a series of aphorisms and parables—paeans, all, to our soul-stealing world. With grim aplomb, Teicher sets about his task, constructing single-page tales that seemingly pre-date contemporary notions of narrative. Historical poetic relations abound: Andrew Marvell’s metaphysical poetics spring to mind, as does John Dryden’s Fables, Ancient and Modern, which Dryden partly penned and partly translated. That our own moment does not separately categorize this tradition of poetic and philosophical narrative (the tradition of Socrates, the tradition of Jesus, the classical poetic and narrative tradition world-wide), is more a fault of modern assumptions than modern interest. Our contemporary notions of what a poem or story might be is curiously truncated by moralism and entertainment: moralism, in that there must be a moral; entertainment, in that there must be a happy ending, or, at least, a just one. The great challenge of literature is always changing, is as mutable as our striving and forgetful cultures—but always, it is some part of the author’s job description to strip away our truisms and describe the gaping unknown. Teicher, in Cradle Book, sits somewhere on the other side, and transmits. “... the wolves are made of something less than air. Their bite is like a breeze. When they run a few leaves shake. Perhaps a flower bends when they howl. "The past year saw several American poets breaking the boundaries of contemporary form to establish new aesthetic frontiers. There was C.D. Wright’s investigative poetry-journalism in One With Others, Thomas Sayers Ellis’s Skin, Inc., a collection of sprawling “identity repair poems,” and Anne Carson (honorary American) with Nox, an elegiac book-in-a-box whose form is indivisible from the emotion it generates. Add to that list Craig Morgan Teicher and Cradle Book, a work that inhabits such a broad swath of forms that no one name can be affixed to it. The book is at once a collection of fables, of philosophy, of prose and prose poems, of aphorisms, creation myths, mystery, and parable. though this is the first time it has ever been told. Teicher’s is a speaker who, like a god, likes to dictate the terms of his universe, of his story, by speaking them into existence. In fact, Teicher’s speaker is not a speaker at all—he is a storyteller. With deictic authority, he tells us to whom the story belongs (this story) and to whom the telling of the story belongs (this is the first time). One night, as if responding to some invisible signal, all the cows began groaning. They groaned and groaned all the next day and did not stop at nightfall. This went on for days and days. No one could sleep. The children were becoming more and more afraid. Nearly driven mad, everyone meeting hall. should they do? No one could agree. The question is a favorite tactic of Teicher’s storyteller, who, like any good god, refuses to answer the questions he puts forth. “Who will rise up,” he asks in “The Voices,” “for mustn’t someone? Who can tell the voices that call for help from those that only call to hear other voices in return? Perhaps it is you. And perhaps it is not.” Here we are witness to the spasmodic changes in tone Teicher is able to induce in his storyteller. By first asking his question in the negative—“mustn’t someone”—the storyteller leverages the responsibility of providing an answer onto the audience. But the clause that precedes this negation is a call to arms, as is the longer second question that follows it. And then: “perhaps it is you,” our storyteller says with a coquettish thread of hope, “and perhaps not,” turning his back on us just as quickly with a snarl. Still, we sense that this bitterness is a dramatic front, a stance that belies a greater panic, a greater foreboding and fear. Men threw their food into the fire, and still the fire burned. They threw their cattle into the fire, and still the fire burned. They threw their wives and daughters and sons into the fire, but still the fire burned. The fire burned the land and the sea, swallowing houses, forests, islands, even the water, which burned burned. They took stones to the water they poured them into the shadow. They poured them in they poured them in the stones vanished. The shadow was not filled it went on growing. There are many stories of fire, but all of them end in the same way: as inexplicably as it had burned, the fire cooled and smoldered and finally went out, as if anything else could happen. Wolves rule these woods. They have overthrown the old rulers, conquered all the creatures, and now these woods belong to them. But do not be afraid if you pass this way. There is nothing here that can harm you, because, of course, the wolves are made of something less than air. Their bite is like a breeze. When they run a few leaves shake. Perhaps a flower bends when they howl. Pass through the woods whenever you like. What you have to fear is not in the woods. I am telling the truth, though that is of little consequence to my captors. It is not the truth that they hope to force from my lips. And they will get what they want—certainly they will, for I can only endure so much, like anyone—but not yet. For now, I still have the will to withhold it from them. First, I will make them abandon all dignity, pride and restraint as they torture me. By remaining silent, I will make them do the unthinkable, even if the price to pay is that I must suffer it. For I have already told them the truth: that we are all capable of anything, any merciless act. They did not believe me. Once they prove I am right, I will tell them the lie they want to hear: that there are some things we will not do. It’s wrong to think of it as a bird. True, it has wings and a beak, but so do many things, in one way or another. And it does have feathers, but don’t be hoodwinked by those. There are also the usual twigs and worms and eggs, but in its nest, if you know where and how to look, you will find something else no bird possesses: the red cipher’s little book of accounts. Only two or three of these books have ever actually been smuggled out of the deep woods, but according to those who have seen them, they are truly astounding. Either because it was commanded to do so by some force of nature, or because it found that keeping infinitesimally detailed accounts was a mysterious key to its survival, the cipher evolved the almost unfathomable capacity to write—in the comfort of its otherwise ordinary nest—the most unlikely and unique book in the world. Like those unusual houses that are much bigger inside than their exteriors suggest, the cipher’s book of accounts has no discernable beginning or end. The lucky few who have seen one report that the book contains the most meticulous records of each and every thing that happened to every creature on the earth, written in every conceivable language. Some who have read the books have even found entries pertaining to themselves, mostly composed of facts that should have long ago been lost to oblivion: the weight of a spoonful of soup from a bowl eaten two decades ago, or a tally of the falling leaves they’ve seen. It is impossible to know why, let alone how, the cipher came to possess or compose its unusual book, or how it has come to know, if indeed it does “know,” the information therein. As might be expected, there are some who believe that within these mythical little books can be found the answers to man’s most fundamental questions. Others swear the answers can be found in a book kept by another creature altogether, one that closely resembles a turtle. Still others insist that the answer to the question of where the answers can be found is one more secret to be sought. To Keep Love Blurry: Poems coming from BOA in September 2012. "To Keep Love Blurry is about the charged and troubled spaces between intimately connected people: husbands and wives, parents and children, writers and readers. These poems include sonnets, villanelles, and long poems, as well as two poetic prose pieces, tracing how a son becomes a husband and then a father. Robert Lowell is a constant figure throughout the book, which borrows its four-part structure from that poet's seminal Life Studies." fold up my paper sail. but the one I’m writing out right now. one’s reflection face to face. it’s already far too late.